Hunt has reason to be excited. This project will help control sedimentation that is slowly filling Mercer Reservoir, the City of Dallas’ drinking water source. To accomplish improvements on nearly five miles of upper Rickreall Creek, Hunt, 28, is coordinating activities and resources between nearly a dozen parties, including permitting agencies, granting organizations, and private and public timber management companies. 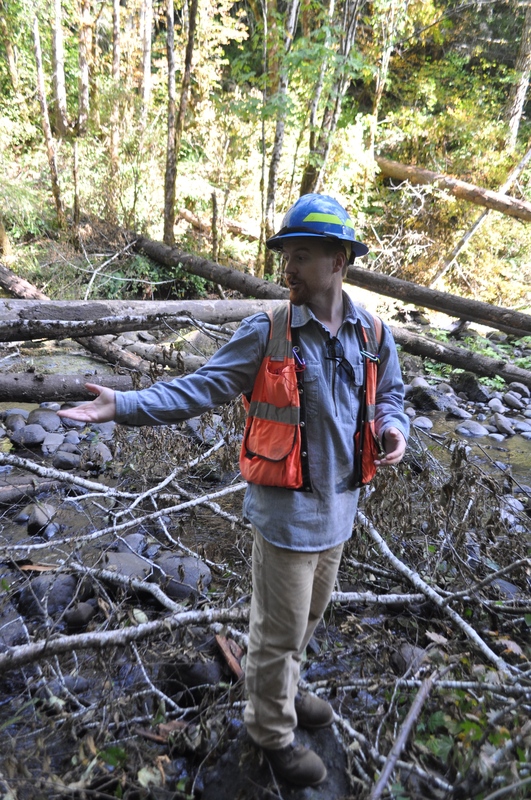 Improving a creek is no small feat, as watershed council members all over Oregon can attest. Next summer, a mile downstream of where Hunt is watching this Vertol 107 helicopter move logs, the Rickreall Watershed Council will implement a similar project using an excavator. While the average log placement project includes 6-10 structures and takes a week, this project placed 522 logs in 34 structures over a 4 day period. “It’s a massive project,” Hunt said of the latest installation from an SWCD program that only had $15k and 160 logs when he took it over in January 2013. 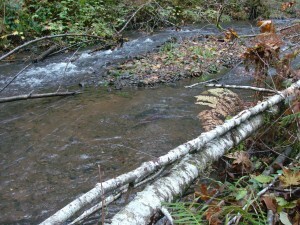 Logs are positioned across or in the creek to slow waters and create pools that trap silt and gravel moving downstream. The structures serve a double purpose, providing habitat and spawning beds for native salmon. Log placements such as those in the Rickreall have been successful in mimicking what might have occurred if streams had not been scoured to bedrock and logged to the banks during the early 1900s. State and federal rules adopted in the 80s and 90s now regulate forest practices, and many timberland managers are willing to do even more than laws require for the waters that flow through their lands, said Hunt. Although constructed log jams are often placed by excavators, this project required moving logs from a mature forest with no roads to a sensitive and equally inaccessible creek. A helicopter proved to be the perfect blend of speed, precision, and mobility required to protect both resources. 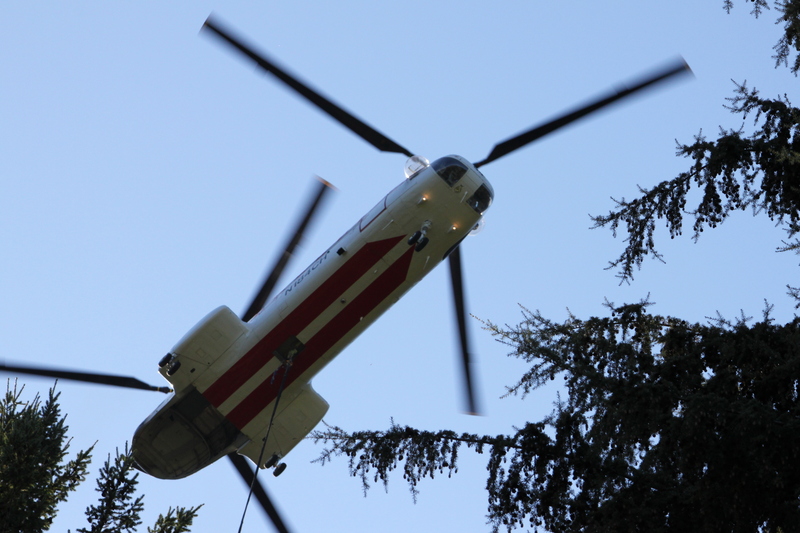 In three or four minutes, the Vertol 107 moves large logs from a thinned forest across the valley to upper Rickreall Creek, where a waiting spotter directs the pilot. 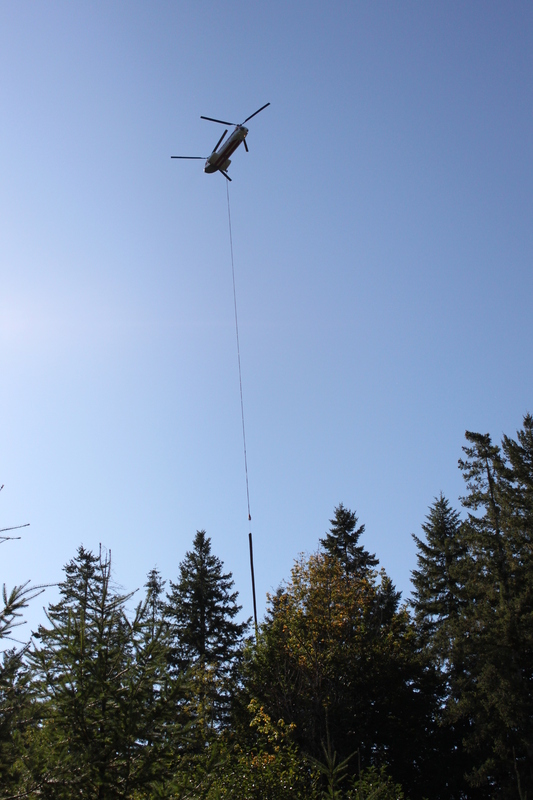 After a minute or two of subtle positioning, the helicopter dips briefly to gently set the logs in place without damaging the banks or streambed. 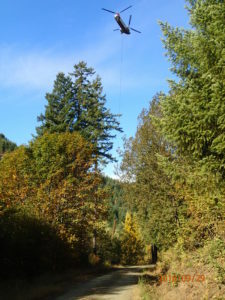 The cable goes slack as it disconnects from the logs, and the helicopter roars away for another load. Rickreall Creek has long been the subject of local improvements, both for the people of Polk County who depend on it for drinking and irrigation, and for fish. Local groups banded together to help slow sediment loosened by the 1987 Rockhouse Creek fire that left hills exposed above the reservoir. In 2003, the RWC worked with the City Arboretum to install 2 engineered log jams in Dallas City Park. In 2011, RWC helped a farmer replace a low water ford to improve fish passage. 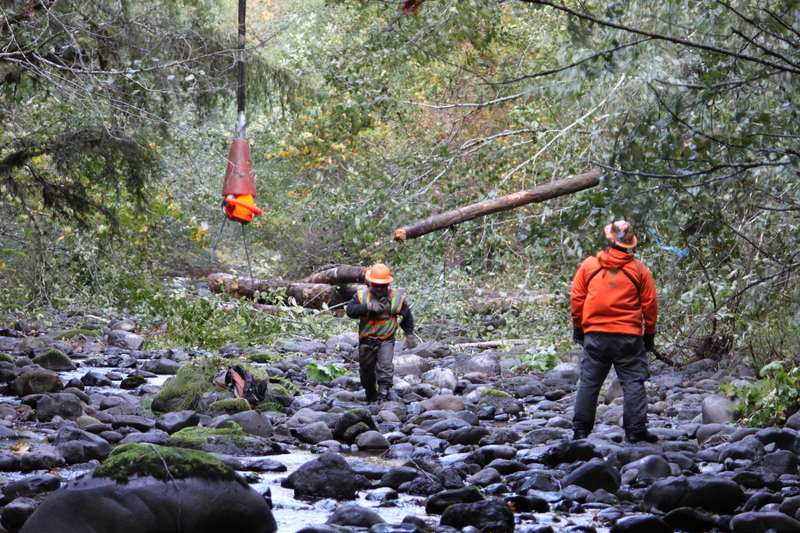 In 2013 the Polk SWCD used an excavator to install 160 logs in 8 structures in Upper Rickreall creek. This project, Hunt hopes, will continue to improve the waters that run from the Coast Range through Dallas and into the Willamette east of Rickreall. It takes a village to restore a stream, and by “village” we mean the owners and agencies that manage the property surrounding the stream, and the groups that sponsored the project. In Rickreall Creek’s case, participants included lands managed by Hancock Forest Management, Mid-Valley Resources Inc., Weyerhaeuser Co., and public lands managed by the federal Bureau of Land Management. About 10 percent of the funds for this $504,000 project came from the landowners and another 18 percent came from local or state organizations. The rest came from federal funds. Specific contributors not already mentioned include the Drinking Water Providers Partnership, Confederated Tribes of Grand Ronde, the Rickreall Watershed Foundation, Oregon Watershed Enhancement Board, the US Fish and Wildlife Service, Oregon Department of Forestry, the City of Dallas and Polk County Community Development, among others. As of 4 August 2016, permitted water rights on Rickreall Creek that are junior to 1 June 1964 have received shutoff notice due to low flows. A training resource for home builders, developers, engineers, architects, landscapers, construction contractors, and municipal staff and crews. Did you have your irrigation water shut off this summer? Do you have questions regarding your water rights? Please join the Polk Soil and Water Conservation District, Oregon Water Resources Department, and the Natural Resource Conservation Service to discuss how and why users received shut off notices this past summer, and to begin a discussion about irrigation efficiency opportunities in Polk County. Click here to register for this free one day workshop focusing on fish habitat and passage! Lunch is provided, but bring your own boots! The afternoon will be spent on the Rickreall Watershed, on lands owned and managed by Hancock Forest Management. We will visit a trap and haul fish program site, a recent bridge replacement, and a habitat restoration site. Come prepared with sturdy shoes and field clothes. A free one-day workshop and tour in Seaside on October 27, 2015. This workshop and tour aimed at forest landowners will highlight best practices to restore and enhance fish habitat in forested streams. The workshop will provide technical assistance, tools and resources to guide the fish habitat and passage process for landowners. Half of the day will be spent in the classroom and the afternoon will be spent visiting recent fish habitat and passage projects in the field. Ponds can enhance the scenic, recreation, wildlife, and fire protection values on a woodland property. This workshop taught by OSU Extension Specialist Steve Bowers will cover the practical aspects of starting a successful ponds project on your property. $10 per individual/family (includes a copy of the Woodland Ponds field guide). See Woodland Ponds Flyer for more details. Register online here or by contacting Brandy Saffell, or 503-397-3462. An upcoming forest landowner workshop in Seaside will highlight best practices to restore and enhance fish habitat in forested streams. 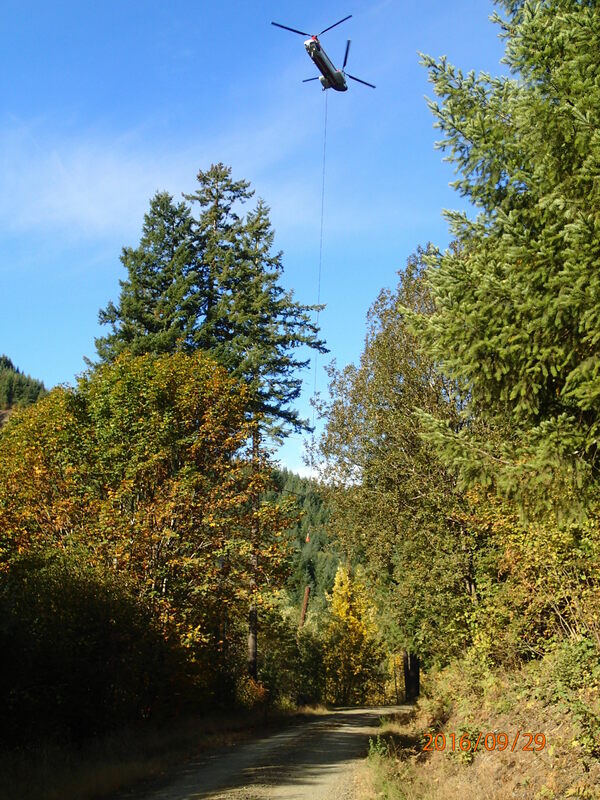 The Oregon Forest Resources Institute has organized the free one-day workshop, scheduled for Oct. 27, in collaboration with various public and private partners. These include the Oregon Watershed Enhancement Board, the Oregon Department of Forestry, the Oregon Department of Fish and Wildlife, Associated Oregon Loggers, the Oregon Small Woodland Association, Hancock Forest Management, the Oregon Forest Industries Council, Oregon State University and Greenwood Resources. The workshop will provide technical assistance, tools and resources to guide landowners with fish habitat and passage projects. Half the day will be spent in the classroom, and the remainder in the field visiting recent fish passage and habitat projects. The aim is to encourage more forest landowners to take on fish habitat restoration or passage. The workshop will help landowners get the information they need to start planning successful projects. The North Coast Fish Passage and Habitat Workshop is scheduled for Oct. 27 in Seaside at the Seaside Civic and Convention Center, 415 First Ave. Registration is available here. Both workshops will be held from 8 a.m. to 4:30 p.m. The deadline to register is Oct. 18. 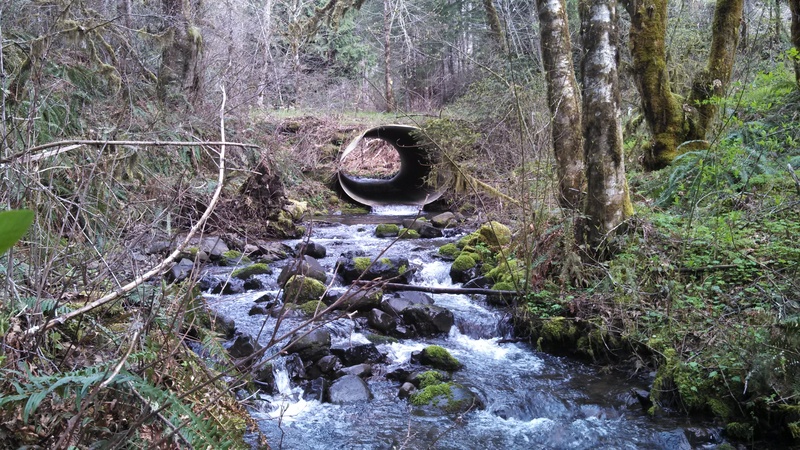 An upcoming forest landowner workshop in Salem will highlight best practices to restore and enhance fish habitat in forested streams. 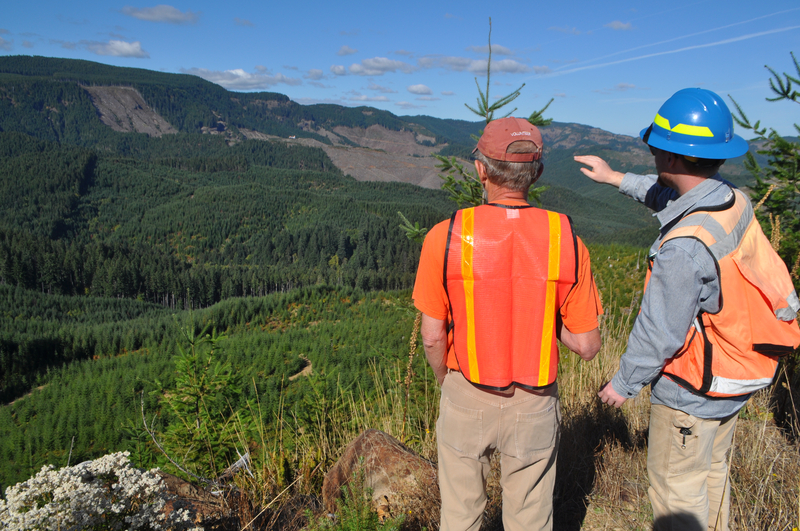 The Oregon Forest Resources Institute has organized the free one-day workshop, scheduled for Oct. 29, in collaboration with various public and private partners. These include the Oregon Watershed Enhancement Board, the Oregon Department of Forestry, the Oregon Department of Fish and Wildlife, Associated Oregon Loggers, the Oregon Small Woodland Association, Hancock Forest Management, the Oregon Forest Industries Council, Oregon State University and Greenwood Resources. The Willamette Valley Fish Passage and Habitat Workshop will take place on Oct. 29 in Salem at the Chemeketa-Eola Viticulture Center, 215 Doaks Ferry Road NW. Registration is available here. The workshop will be held from 8 a.m. to 4:30 p.m. The deadline to register is Oct. 18. Outdoor movie on the banks of the Willamette with live music – activities – friends – fun! Bring blankets, snacks, and warm clothing!